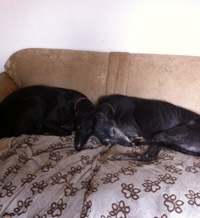 Alison is a lovely ex-racing greyhound who is black with a white chest. She was born on the 16th August 2008 and weighs 29.6k. She is spayed, flead, wormed, microchipped and her inoculations in the process of being brought up to date. 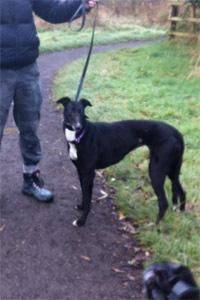 Alison is a very friendly girl who knows her name and will come when called. She travels well in the car and loves being stroked, cuddled and receiving attention. 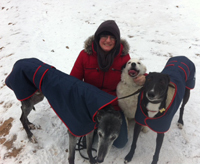 Pat, one of our branch volunteers collected two greyhounds today from their owner and brought them here. One was Taylor while the other was Alison. Upon their arrival we put them in the emergency kennel where they were flead, wormed and fed, which is our normal practice. Alison unsure of her environment decided it was not for her and jumped onto the generator unit in an attempt to jump the fence, but was thwarted by the tree branches the other side and Pat who grabbed hold of her. 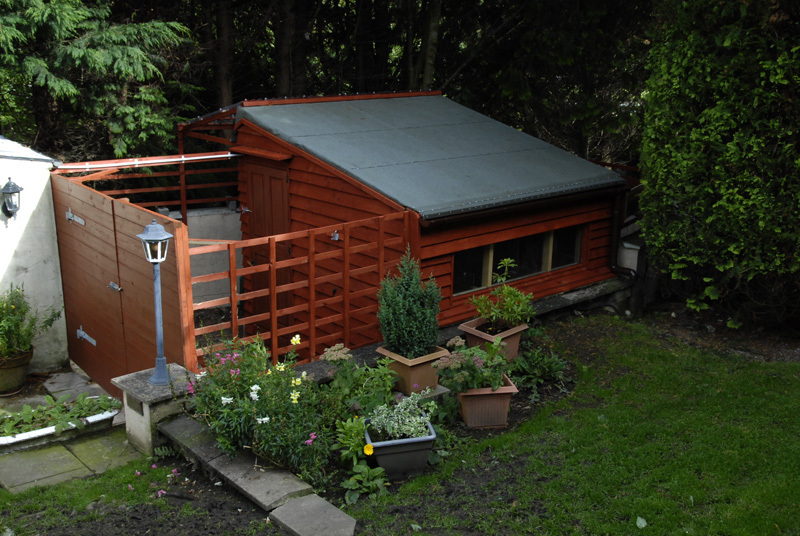 There is now a pair of open step ladders laying on the unit to deter any further attempts until Stuart can make the fence another rung higher. Despite early nerves of all that had gone on so far today Alison is a lovely girl, who knows her name and wants to be stroked and have cuddles. Once fed she quickly settled to her new bed in the branch kennel, where she will live until she is re-homed or a foster home becomes available. Later after we arrived back from doing a home check she was fed and allowed to roam the run around the kennel to do her toilet. 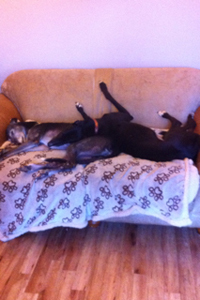 Having done all she went back in the kennel, we put the light on for them and they settled for the rest of the evening. 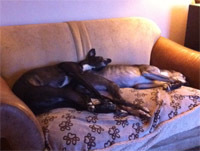 The camera in the kennel is superb as we can watch how they are from out laptops in the house. Just before we went to bed we let them out again to do their toilet, put bedding coats on them and settled them down for the night. Alison was fine during the night and gave me a wonderful greeting when I let her out first thing to do her toilet. Mind you the biscuits I gave her as a treat probably helped let her know she was in a nice place. Leaving the bottom half ot the door ajar so she could wander in and out the kennel as she wanted we left her to settle again while we did the bed and breakfast guests their breakfast. When all was tidied away I let Alison out the kennel and she explored the garden and paddock. I left her and Taylor to themselves while I went in the house and made their breakfast. Carrying it down to the kennel I wondered how I was going to get them back inside, but I need not have worried because sight of the feed bowls brought them both running. Food eaten they were left once again to the kennel and the area around it while I got on with the rest of my work. During the day I kept nipping down to see them, receiving a wonderful welcome on each occasion. 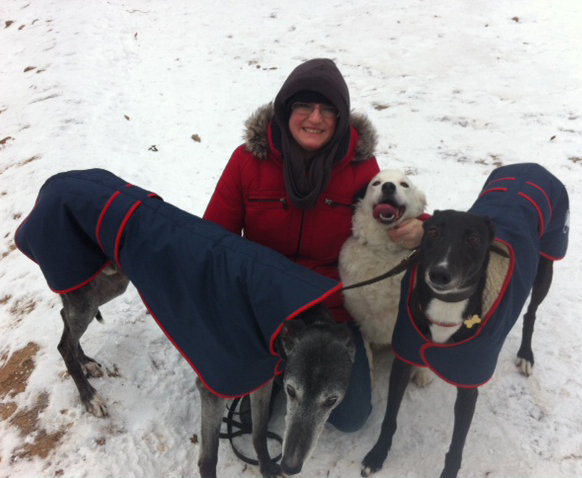 I kept their bedding coats on them all day today because the weather was lousy. Alison became a little unsettled around tea time so we made them their dinner. As it was raining we thought we'd put the light on for them and close the door for the night, but Alison wasn't happy, began to cry and stood by the door as if asking out. Consequently, I opened the door again for them to wander in and out and that settled her. The bottom half of the kennel door stayed open until it was last toilet and lights out for the night. This morning Alison went to the vet for her first inoculation and to be spayed. She weighed in at 29.6k. 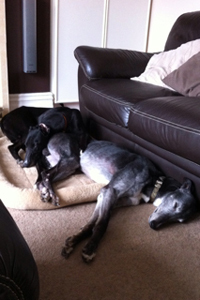 All went well with the operation and we collected her and Taylor around tea time and brought them home. Put them in the kennel, which had been made cosy for them and we left them to sleep things off for an hour or so before giving them both something to eat, which they enjoyed. We left the bottom part of the kennel door ajar for them so they could go out and do their toilet and a little later we went back, checked they were alright and shut them up for the night. With the camera viewing onto the laptop we were able to keep an eye on them from the house. Since Alison arrived I've tried to keep to a very strict routine with regards feeding them and their care to provide them stability. She now knows not to jump up at me when I go in, knows which stand her dinner will go in and she understands 'stay there, back soon' when it's time for me to leave them. This afternoon a couple arrived with their 11 year old greyhound called Joey. Joey had recently lost his companion and they wanted him to choose his new one so they came to see Lonely and Alison. Joey got on well with both, they took them both for a walk and the couple wanted to have the pair of them, but knew they couldn't. Decisions, decisions! As they wanted to take one home with them I suggested they went to the pub along the road, have a chat and think things over. They came back a while later saying it was very difficult, but they have chosen Alison - my little Alibali. The adoption paperwork was signed and off they went with her and Joey to their car, and off home. I didn't get chance to see her get in and wave her goodbye because some bed and breakfast guests arrived who I showed to their room. I shall miss Alison and although she was rather sensitive to certain things she was a bundle of fun and we wish her a long and happy life with her new family in her new home. Poor Taylor who came from the same kennels as Alison and who were in our kennel together fretted for her by the garden gate for a while until I distracted him with his dinner and a big cuddle. He then quickly settled with Lonely in the kennel. We received an email today from Alison's new owners letting us know that Alison, or Ally as they now call her, has been getting on really well, she had one little accident during Saturday night but since then has been brilliant in the house! She knows to go to the toilet when they go into the yard and is really enjoying her walks. Joey, their other greyhound and her are good together, and there hasn't been a cross bark or growl between them. They both slept the whole way home on Saturday evening. They are still training her not to jump up on the counters but they think this may take some time, they nearly lost a bag of bread rolls last night but caught her in the act! She has already met some of their extended family including their 3 year old nephew and was so calm and loving that she is already a favourite with them. Heard today that Ally is doing really well and everyone loves her. 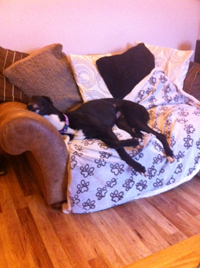 Joey is completely at ease with her and she enjoys her daily walks around Reddish and Reddish Vale! We received an email today letting us know that Ally is settled in nicely, it feels like they've had her forever. She is quite mischievous and likes to pick Mike's trainers up and bring them back to her bed, so far she hasn't chewed them so they'll be keeping a close eye on her just in case she starts! 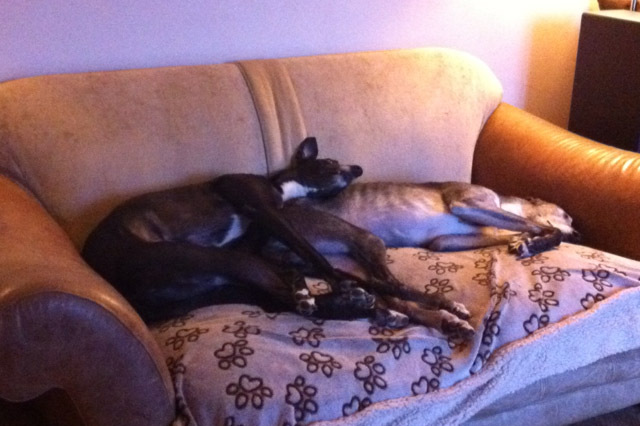 As you will see from most of the pictures she certainly likes to sleep especially when it involves lying over Joey! 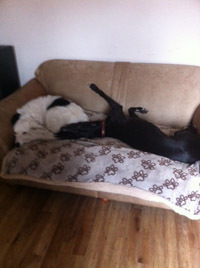 She has also made friend's with her owner's mother-in-law's dog Jasper who has stayed over on a few occasions. She has been to Glasgow to visit their sister and they are off to Northern Ireland next week for Easter so she will love running about their parent's garden. The picture in the snow was taken at Alderley Edge where they are all trying to keep warm! her new blanket - think it's a hit! Joey and Alison taking a nap.